A hatch! 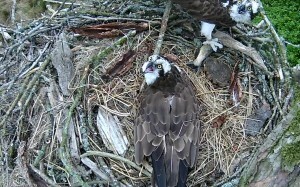 We saw our first osprey chick of the season hatch between 7 &7.30 this evening. Both KL and the male had been changing their behaviour today and we thought at one point we may have seen some pipping in one of the eggs…..we then convinced ourselves not….but we were actually right, and here is the evidence. 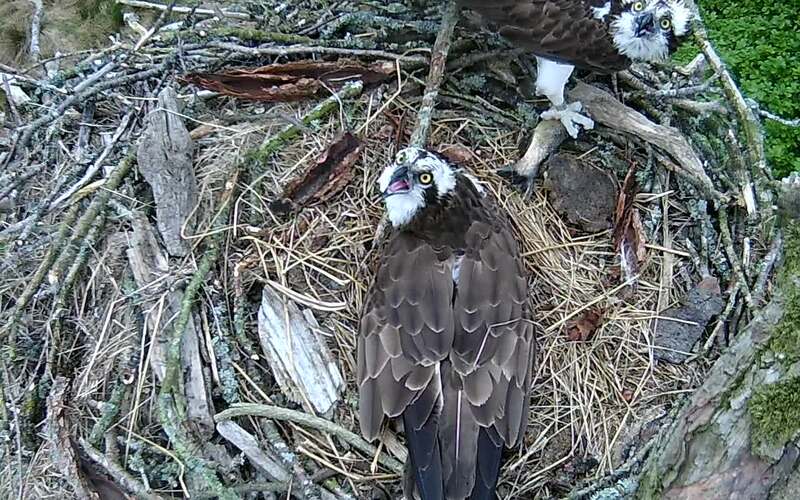 Welcome to the world little osprey ! 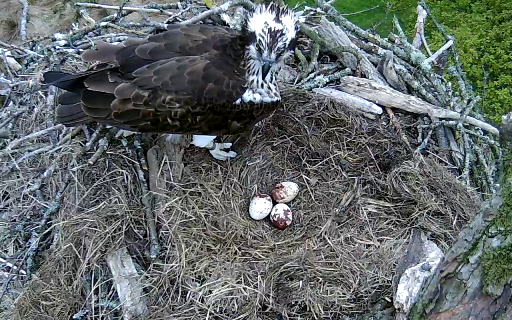 No signs of an egg hatching yesterday – although everybody was willing it to do so. At the Big Screens at Whinlatter we are inspecting the eggs minutely whenever the parents change over on incubation shifts for any signs of crack or chip that could be caused by a questing egg-tooth. Unring has surpassed himself in bringing up nesting material – for the first time great hunks of verdant moss. He keeps himself occupied by shredding these to pieces when sitting. A great improvement on the manure lumps early in the season. 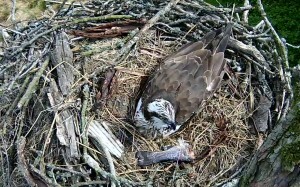 Osprey eggs generally take between 36 and 39 days to hatch. KL laid her eggs on April 23rd, April 26th and April 29th. As ospreys begin brooding as soon as the first egg is laid this means that the first could hatch today!! Or it could be tomorrow or the next or the next and in any case no-one should count their ospreys before they are hatched! As far as we can tell this has been an uneventful incubation, with very few human alarms or disturbances – thanks to our 24hour Protection Team. Inside the eggshells though we hope for a much more dynamic story, of growth and life and change, from a simple string of cells to an infinitely complex structure with the potential to breathe, eat, and eventually fish and fly. At this moment the chicks inside should moving around under their own volition. Their tiny hearts will be beating and stick legs kicking, maybe even the first involuntary taps and shoves with their beaks at their calciferous womb wall. KL and Unring will certainly be able to feel the eggs quivering. With any luck we may also be able to witness the hatch through the eye of our nest camera, whenever the parent birds raise up. In the meantime – Keep off crows! 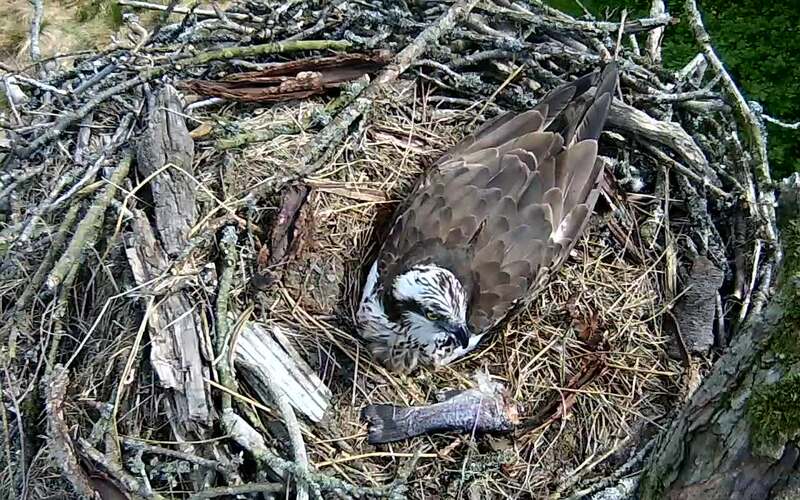 Osprey lunch or sad ending for the Little Mermaid tail? The strategies and quirks of individual birds add fascination to the study of the species. 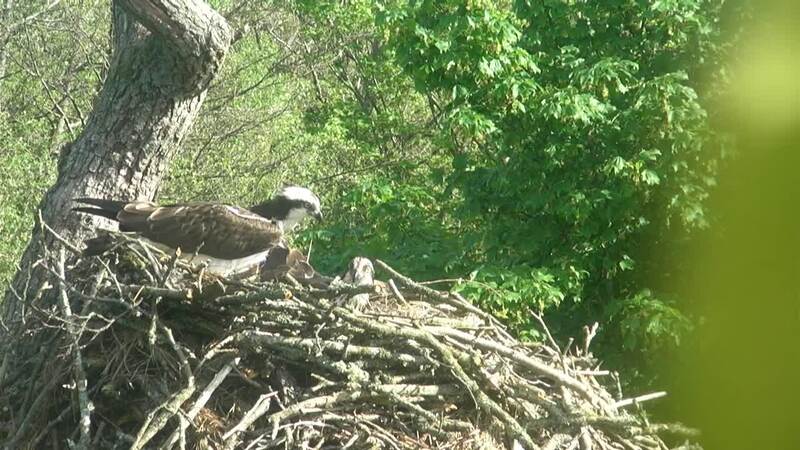 KL, unlike previous females, will eat and leave fish on the nest. Is this because she doesn’t like leaving the eggs or because she gets fed up of being mobbed by crows when she perches anywhere else? Surely this is not a good strategy as it must tempt any self respecting crow to try its chances for a free meal. Unring had a busy time yesterday trying to keep them away. On a different front, building the nest has been a top priority for Unring this season. He has worked and worked at building it higher and higher and lately KL has joined him in bringing in yet more sticks and river flotsam. It must be getting on for 5feet tall from the base. The result of this is a pyramidal structure with the apex becoming smaller and smaller, with less and less room for the two birds to manoeuvre. With 3 growing offspring they might wish they had planned for a bigger bedroom! In contrast a recent picture of the Kielder Forest nest showed a wide platform, completely bereft of branches, and the birds sitting in a small scrape dug out of the peaty remnants of last year. So, for wild creatures variety is not only the spice of life but (as with mermaids) the choices they make may be the tipping point between success or failure. With the lovely weather we’ve been having recently, we’ve had plenty of visitors, both at Dodd Wood and Whinlatter Forest. Visitors even saw our male fishing on Bassenthwaite Lake, successfully catching a fish after his second attempt. As a volunteer for the Lake District Osprey Project, I’ve been able to help by speaking to visitors both at Dodd Wood/Whinlatter Forest and by directly protecting the bird to ensure that it’s not disturbed. Since becoming a volunteer, I’ve not only been able to learn more about this fantastic bird, but also been able to help others learn more about it (answering any questions that they may have). It’s allowed me to learn new things not only about Ospreys, but also other wildlife too, which will undoubtedly help with my course as a Wildlife & Media student at the University of Cumbria. Many thanks to the whole team for the great work that they do, and allowing me to get involved with this great project! 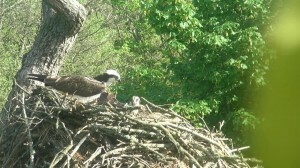 Lake District Osprey Project News from Around the World! 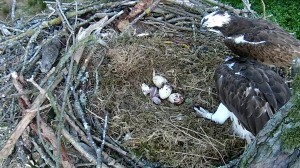 In the English Lake District our two adult ospreys are sitting on three eggs. The parents are brilliant sitters and the eggs are rarely shown. Many thanks to our friend on Bioko. Today we removed the infrastructure from nest 1 in Wythop forest. Ospreys bred here in 2001, they were an unringed male and a Scottish female, and were the first pair of ospreys to breed successfully in the Lakes for 150 years. They heralded the start of the re colonisation of England by ospreys after being persecuted to extinction in the 1800’s. 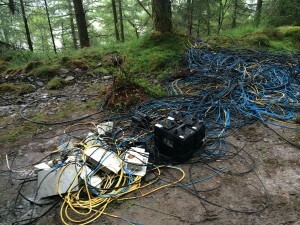 After the birds stopped using the site in 2009, moving to another location, the site has been unoccupied, and we have now removed the cables, sensors and cameras due to enable essential forest management work. Our hope is that after the work, this site will again become desirable to ospreys, and we once again see birds using this iconic site in Wythop forest. Watching a bird incubating eggs is said to be a bit like watching paint dry or perhaps more aptly, watching a slow motion tumble dryer in the laundrette. Nothing happens for long periods but it can be very addictive in its restfulness. This goes for our birds as well as the people watching them. Over the past two weeks KL has been really getting into Big Moma mode and sits tight, often drowsing in cat naps, she is so relaxed. Unring, not having quite the biological stimulus of KL took a bit longer to get into ‘egg mode’. For the first 24 hours he was still completely focussed on nest building (his overriding mission for the previous two weeks) Slowing down from this intense activity, understandably. took a little while. Watching him brooding the eggs was like watching an ants in the pants comedy as he twisted and stamped around, trying to get comfortable, turning the eggs every 10 minutes and fiddling with every stick and bit of hay within reach. However, 3 days on he had calmed down and now thoroughly enjoys his allowed brood time.